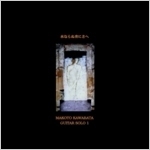 First collection of solo guitar works by Kawabata Makoto. Dazzling music for the temporal world, overflowing with a sense of pellucidity totally different from his work with Musica Transonic. studio recordings.